approach the shore to greet the waders there. 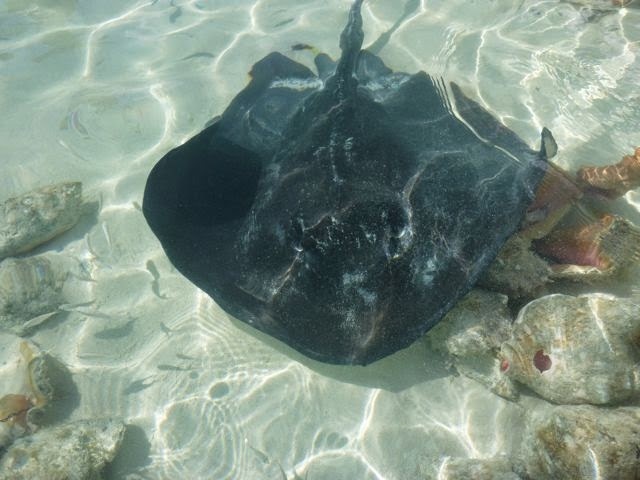 Stingrays among my favorite marine animals to watch; right up there with dolphins, whales, pelicans, and, so long as they’re at a distance, sharks. As they flick their wingtips to propel themselves gracefully through the water (and sometimes the air, too!) 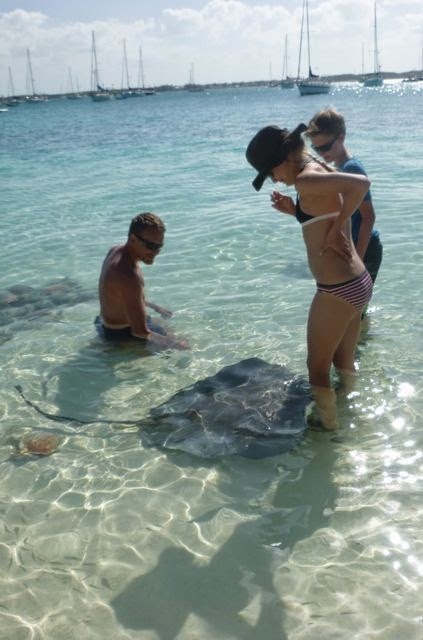 they seem to fly (no surprise one species – my favorite -- is called an “eagle ray”). 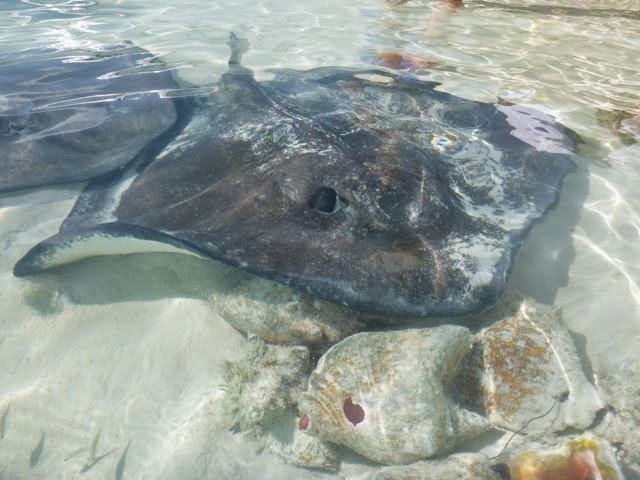 I won’t hesitate to follow rays in my kayak or a dinghy; they don’t seem to mind it. While they’re not known for attacking humans (Crocodile Hunter Steve Irwin’s a notably famous exception), swimming or wading, though, I generally give wide berth out of respect to their stingers. at these guys, especially since they’re not shy. 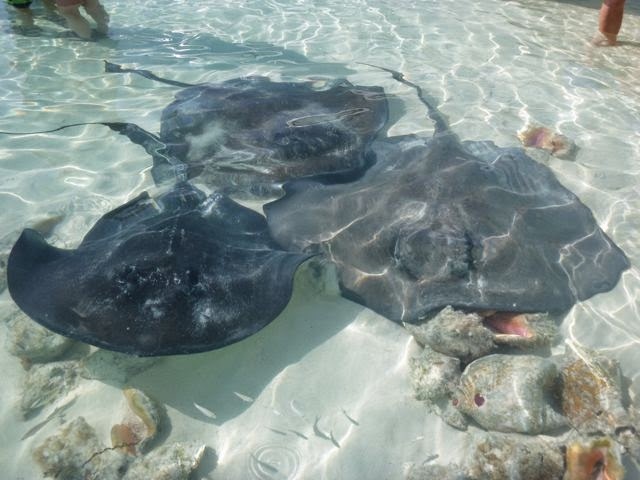 Yet, these fellows at Stocking Island were the friendliest (or gals – not sure how to determine a stingray’s gender) I’ve ever encountered. After watching them gently rub up against several other waders, studiously keeping their stingers clear of them, I was willing to get really close to satisfy my curiosity. Eventually a few came up and rubbed gently against my calves, and didn’t seem to mind my exploring their topside with my fingers. 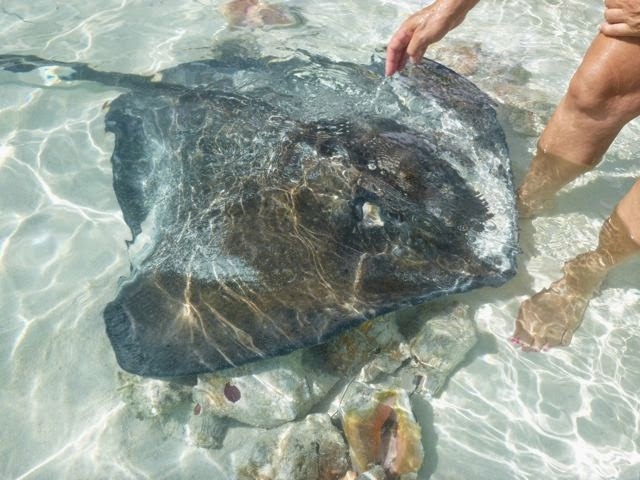 While I’ve swam with rays, followed them, and watched them come for feedings along with nurse sharks when fishermen toss out fish parts, I’d never touched one before; never expected I would before, either. Another “Wow!” magical moment I feel fortunate enough to experience in my life. What are some of your magical moments? 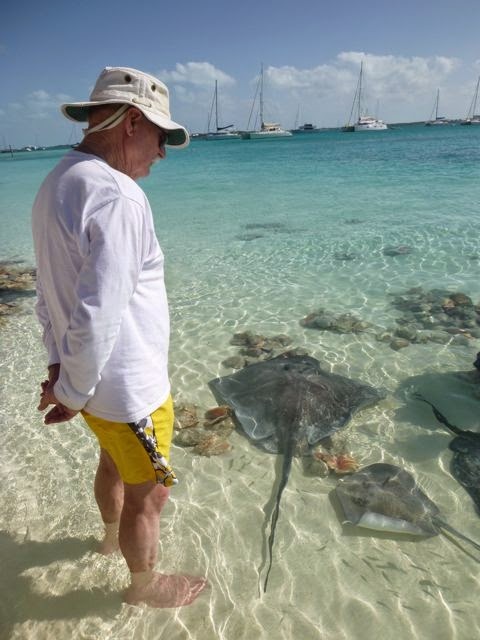 While weather and engine concerns dually conspired to keep us from taking Wayne’s Dad and his wife to see Major Cay’s swimming pigs and Staniel Cay’s Thunderball grotto, the rays were, well, a ray of sunshine in our week together. tail is not too far from his feet. 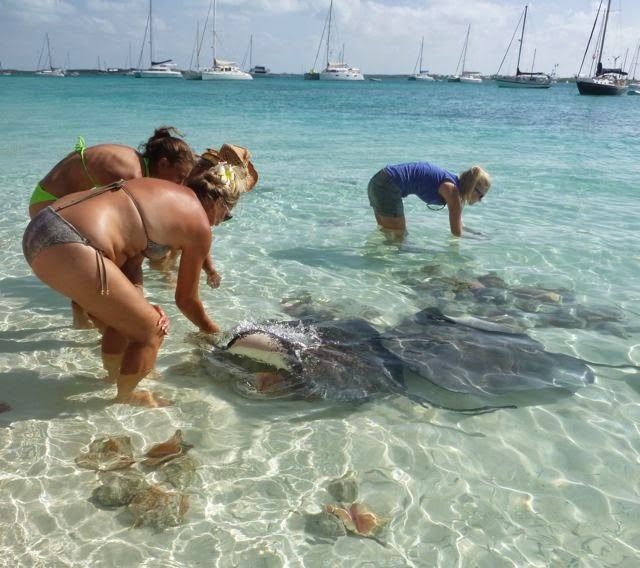 April 3, 2014 BAHAMAS. This is a recent Exumas retrospective; Volleyball Beach, Stocking Island, across from Georgetown (N23.31.126 W75.45.144). We're currently in near Duncatown in the Ragged Islands (N22.14.920 W75.45.106). 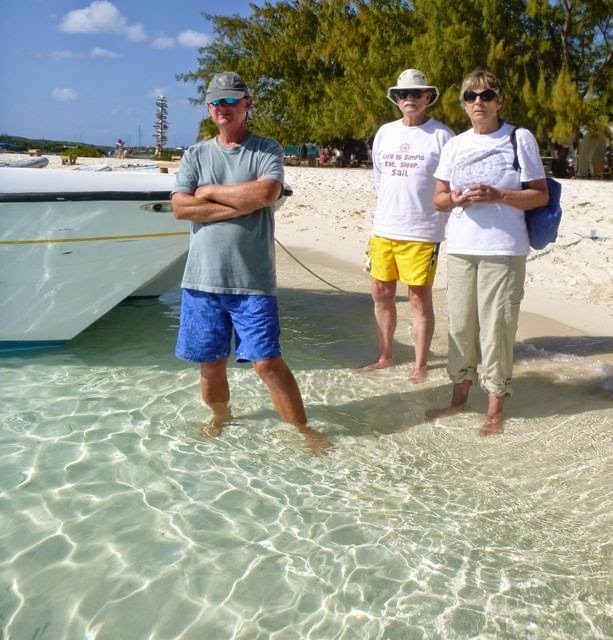 We're enjoying it, and will move on when prevailing winds make it easy to sail to the Southern tip of Long Island's Little Harbour. I swear this guy was coming up to say Hello!”Or maybe he was interested in some guppy sashimi.Anyhow, he flapped right up againstmy leg with velvety soft skin. The center topof the ray was rougher in texture. reaches down to touch one.